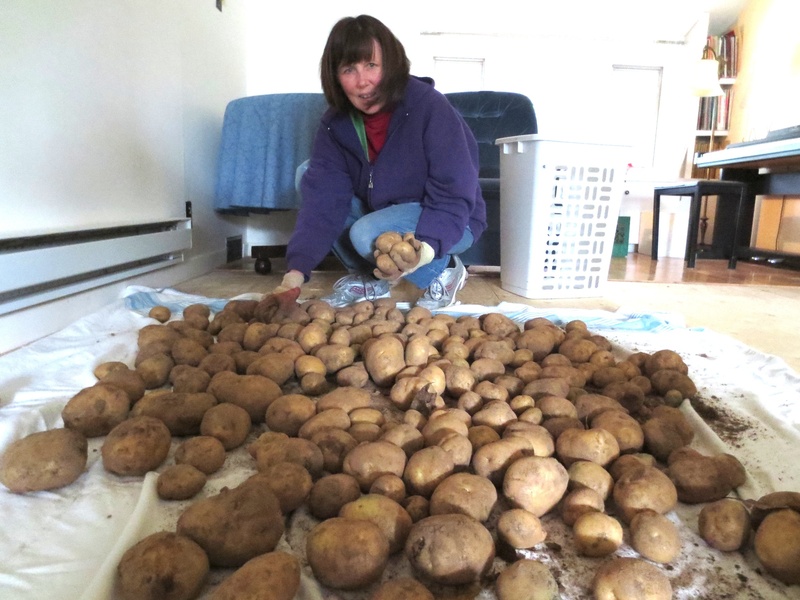 Kathleen lays out potatoes, freshly dug, on our living room floor for drying. I had this conversation with a young person the other day. Young Person: I can’t eat that. Doug: Why not? I grew it myself in my own garden. Young Person: Look at it! It’s covered in dirt. Doug: I’ll wash it off. Young Person (hot with conviction): It grew in the dirt. Dirt! Bugs crawled all over it–I get sick just thinking about it. Doug: That’s the way things grow. Soil, water, sunlight. Fertilized by you know what. Young Person: That’s disgusting! I’m not eating anything like that. Doug: Well, Precious, where does your food come from? Young Person: You really want to know? I can’t believe this! It’s like I’m talking to a child. See this. (points to a bag of cookies) It’s clean. No dirt! And it tastes good. It has a brand name everyone’s heard of so you know that it’s safe. Our conversation breaks off here. We go our separate ways, convinced the other is a lost cause. The young person believes food grows in plastic bags with fancy labels, protected by factory protocols from such harmful things as the outdoors and natural elements. For my part, I think such humble things as soil, water and sunlight may be essential for the growth of food. Furthermore I believe it’s unwise to despise the very things that are essential to us. How can two sides have a conversation when each side feels their religious values and indeed their very sanity is being called into question? Freud coined a phrase “reality testing,” which he claimed each of us do all the time. We are constantly testing ideas and images with everyday experience. This is not to say we don’t fool ourselves and make up crazy justifications for foolish actions. You might say every act and exchange is a kind of test, but we fudge the results. We cheat, misread and ignore the results of our tests. Freud believed that the perpetual cheaters developed nervous disorders. He believed this could happen to cultures and to societies as well as to individuals. Is there any way we can reality-test our food, religion, sanity debate? One test could be: try growing your own food. Try growing food outdoors in soil; try growing food indoors without soil, water or sun. We can give a name to this test: self-reliance. Why is self-reliance important? It’s an aid to survival. It develops character and self-confidence. It provides an individual with a solid foundation from which to grow. The opposite of self-reliance is dependence on others. In a specialized world, we all come to depend upon the services of others. But with this dependence, we learn to be critical, to compare services and costs. We share notes with our friends and join networks. We are vigilant to avoid scams and traps. When we receive bad service, we protest and boycott. In short, we become wary and diligent shoppers. This is another form of reality-testing. In a complex world, we need both forms. We need to do things for ourselves and when it’s not practical to do this, we need to join networks that engage in critical evaluation. The young person and myself, we may not always agree on our food, but I hope that we can agree that helplessness, isolation and uncritical thinking are harmful ways of being. When we agree on the importance of productive and active reality-testing then we can start to join together and build a truly healthy community. This entry was posted in General by dougcube. Bookmark the permalink.